Ryan and his friends don’t think twice about stealing some money from a wishing well. After all, who’s really going to miss a few tarnished coins? And she demands payback: Now Ryan, Josh, and Chelle must serve her . . . and the wishes that lie rotting at the bottom of her well. Each takes on powers they didn’t ask for and don’t want. Ryan grows strange bumps–are they “eyes”?–between his knuckles; Chelle starts speaking the secrets of strangers, no matter how awful and bloody; and Josh can suddenly–inexplicably–grant even the darkest of wishes, the kind of wishes that should “never” come true. 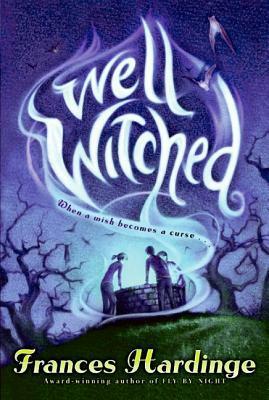 Darkly witty, wholly unexpected, and exquisitely sinister, Frances Hardinge’s “Well Witched” is one well-cast tale that readers didn’t know they were wishing for. Why did I read this book: Because and I mean it: I have fallen in love with Frances Hardinge’s books and have loved every single one of them: Fly By Night, Twilight Robbery, Gullstruck Island and A Face Like Glass. This one was the Last Hardinge left for me to read and I was saving it for a rainy day. That day was yesterday. My last Frances Hardinge (woe). Kind of blew my mind away. Three friends Ryan, Chelle and Josh find themselves without their bus fare home and daredevil Josh climbs down the local Wishing Well to collect some of its coins to pay for their journey. Then weird things start to happen. Ryan gets warts on his hands – warts that turn out to be eyes that give him second sight. Chelle starts to broadcast other people’s thoughts, uncontrollably babbling out loud what they are thinking. Josh affects the magnetic fields around him giving him power over metal and electronics. In the meantime, Ryan also starts dreaming about a terrifying figure and that’s when it hits them that what they stole were wishes and now the spirit of the well expects them to grant those, aided by their new powers. At first, things seem easy enough. A guy wants a Harley Davidson, let’s get him one. A girl wants to hook up with the person she is in love with, let’s get them together. But soon the kids realise that wishes are not as straightforward as that because sure, the guy might wish for a Harley Davidson, but what he really wants is to be cool. And how can they possibly ascertain those different layers? And what happens when someone wishes for something negative to happen to their enemies? Just then, things get really out of hand when Josh starts to enjoy his powers a bit too much. Some ten yards away, Ryan stood there stupidly holding a carrier bag full of canned sweetcorn while he watched the continents of his world collide and the stars fall out of the sky. Almost involuntarily he started counting through the Fibonacci sequence in his head to keep himself sane. One, two, three, five, eight…Today the numbers failed him. The way they built up only seemed an echo of what was happening before him, where every bitter sentence added to the last to make something bigger and worse. Although in a way this does feel like more of an internalised story. Her other books deal with characters growing up in the middle of revolutions or in grandiose, extravagant settings and as such, internal and external conflicts develop side by side. 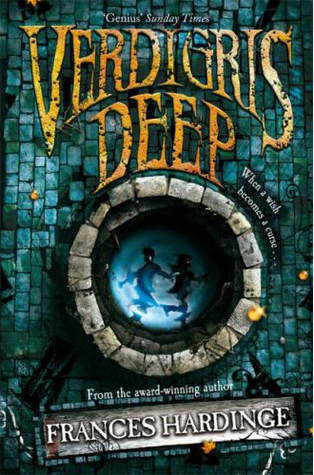 In Verdigris Deep , the story is informed by the three characters and the powers they gain are granted according to their personalities. Popular, energetic but unloved Josh gets the most flashy of the powers, the one that allows him to ascertain more control over those around him. Both Ryan and Chelle worship Josh to the point of blindness even as he is cruel and unsympathetic. Chelle is insecure and shy and kind of the outsider in the group, always babbling away even though the others never pay attention to what she says. At one point, Josh cruelly refers to her as the coleslaw of the group – a side dish that you eat up but don’t really care for. Ryan is the focal character and he is quiet and lonely, never saying what he really wants or means. His narrative starts off as unsympathetic, detached and even a little bit callous when describing the people around him. The story progresses as the powers they have gained help Ryan developing a great degree of self-awareness. The realisation about the hero-worship behind his relationship with Josh as well as his own capacity for cruelty (after all, doesn’t he also think of Chelle as the coleslaw?) are only part of how the relationships and the characters are deconstructed, pulled apart and then built up again with sympathy and compassion. In spite of all of the hijinks, the fear and the creepy factor of the novel as the kids get more and more involved with the Spirit of the Well, this is much more of an understated, quiet novel. Because this is a book that is much more about the microcosm than the macro, it doesn’t end in Revolution or Change with capital letters in quite the same way that Hardinge’s other books do. But it is still in many ways, a book about revolution and change just as much because in the end, the kids’ lives have been altered, bettered and they have grown up. It is a very emotional, touching and humane story. So basically, what I am saying is: Frances Hardinge is right now, my favourite writer. Let her career be a long and prosperous one. Rating: 8 – Excellent, leaning toward 9. Seriously, I have got to jump on this Frances Hardinge bandwagon. I keep hearing great things about her from EVERYBODY. I also have never read a Frances Hardinge book. This looks like a good one to start with. Yes! Ditto to everything above, I loved this one. It was my second Hardinge, so I kind of love reading how it kind of sticks out from all of her books. This one completely took me off guard. It seemed so much more whimsical it had me fooled into thinking it was a Diana Wynne Jones type book before it got TOTALLY CREEPY. I also pulled out the line “We always find it difficult to forgive our heroes for being human.” I love how FH can have her characters say stuff like that as if it is a throwaway line from father to son, when in reality it’s one of the most profound and true statements I’ve ever read. Also, you still can pick up Under My Hat which has a story by her (and a lot of other amazing people that has me questioning why I haven’t bought it yet myself). I’ve never read any of Hardinge’s books but this one sounds like a real winner. The whole premise feels very much like a metaphor for growing up, delivered to us in a very unique (and creepy?) way. This is definitely going on my TBR list, close to the top! Can’t wait for this one. I read this one earlier this year and loved it as well. Hardinge just manages to work so much into her books–she’s an incredible talent. Yay! Thank you so much for talking up Frances Hardinge’s work. Her stories are fantastic and originial, and her writing is top-notch. But, it seems sometimes like nobody has heard of her. I love her books. Love them.